Steam locomotive. LOCOMOTIVE IS IN EXCELLENT CONDITION. MADE IN WESTERN GERMANY. COULD USE A LITTLE CLEANING. FOUND IN BOX IN ATTIC. #1306 RED WITH SILVER ROOF. YARD SERVICE SWITCHER. NEEDS REPAIR TO RUN. COULD USE A LITTLE CLEANING. FOUND IN BOX IN ATTIC. MADE IN WESTERN GERMANY. 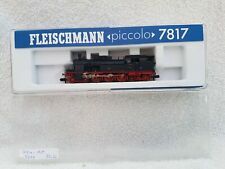 FLEISCHMAN 4171 CLAUSS MAFEI HO CLASS BR 03-1001 DC ERA II - STEAM LOCO. FLEISCHMAN BORSIG HO CLASS BR 03 1001 STEAM LOCOMOTIVE. HO CLASS BR 03 STEAM LOCOMOTIVE. NOT A TOY. BLACK COLORED. Fleischmann 6012 H0. Marke Fleischmann. finden Sie eine große Auswahl von weiteren Zubehör, Gleisen, Weichen, Waggons usw. auch zum Sofort-Kaufen. One rail / tanker car marked " ESSO ". One rail / tanker car marked " SHELL ". Made in West Germany. 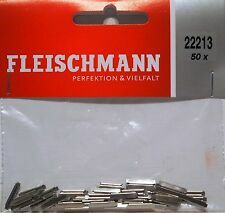 This is a Fleischmann 22213 N Scale Rail Joiners (app. 50 pieces per pack.) Manufacturer: Fleischmann. Model Number: 22213. MSRP: 6.49. Scale/Era: N Scale. 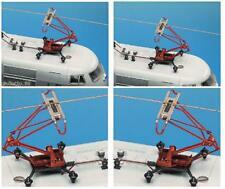 Model Type: Track/Switches/Etc.. Availability: Ships within 3 Business Days!. Little used Fleischmann HO 4401 OBB 2 car Diesel Railbus fixed (see headline for car unit numbers) - Blue/white /silver. Good runner with directional lights. Appears to have seen very little use. Box and lid shelf scuffed complete with instructions. This is an opportunity to acquire a super Fleischmann HO DEB Cargo Locomotive Ref 4215 R/N 212 311-5 for German Railways. It has KD Couplings and buffer are intact. Directional lights. To the underside it has Fleischmann Made In Germany 2/1. MINT BOXED. PERFECT - Test Run only. Good runner but no couplings, with all valve gear, handrails and boiler piping. Fleischmann 22213 - 50 x Rail Joiners (fishplates) for N Gauge. Add to Favourites. Marked "made in Western Germany". Super runner. Appears to have seen little use. Item No: 9115. We will always find the cheapest quote based on the weight of your item. Dispatched from the UK. Add to Favourites. made with love by.